Arrests as Italy probes public works. Italian police have arrested four people and raided dozens of premises over suspicious public works contracts worth some €25m (£18m; $26m). A former manager at the public works ministry, Ercole Incalza, is one of the four people detained. Rail and motorway contracts, including part of Italy's high-speed TAV railway line near Florence, are under scrutiny. Investigators suspect that the awarding of contracts was influenced by bribes paid to certain officials. The arrests took place in Rome and Milan, while police searches took place in towns and cities throughout Italy. Fifty-one people are under suspicion over the contracts, including some politicians. Former MEP Vito Bonsignore is among them. The investigation includes contracts related to the Italian Pavilion built for the Expo 2015 World Fair in Milan. 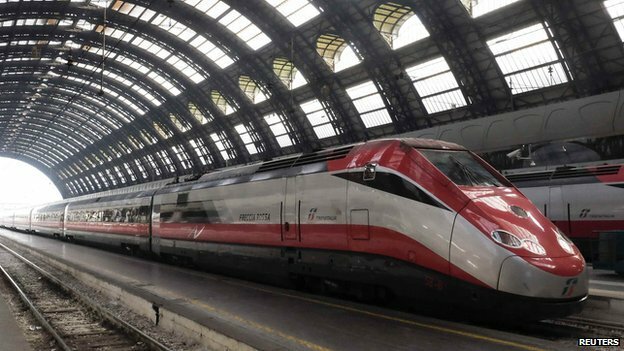 The development of Italy's TAV rail network has been dogged by corruption allegations. Last month, the EU opened a fraud investigation into the Lyon-Turin high-speed line, which is under construction. In December, police arrested 37 suspects in and around Rome, in a similar crackdown on alleged corruption in the awarding of public works contracts.